Our design capabilities ensure that we are successful with major OEM projects both in Australia and overseas. Flexibility has been the key driver that has underpinned our success to date, not only can we mass produce products, but have always been able to meet our customer’s needs for small quantities and replacement items. When it comes to quality idlers and frames, the Brand name Tyton is synonymous around Australia. Tyton have been manufacturing quality idlers, frames and structure since 1988. VLI have upheld the strong distributorship of Tyton products internationally from our own manufacturing plant. VLI produce full 3D models and detailed drawings in A3 format. Detailed idler data sheets are provided for each type of idler manufactured to ensure the correct replacement of idler rollers or idler sets. Idler Design Selection is computer aided. The shell is fabricated from ERW 200 – 350 Range to AS1450, conveyor tubing. Each end of the shell is machined to accept the end discs to ensure concentricity and maintain correct bearing alignment. The roller end discs are fabricated from hot rolled steel strip to AS1594, HA4NP precision pressed in automatic presses, which ensures bearing bores are sized accurately to house the bearing and also ensure bearing housing is square to roller centre line. The roller end discs are welded to the barrels using 3mm CF welded to AS 1554 GP in a special double-ended welding machine, which gives a minimum of 70% weld penetration. 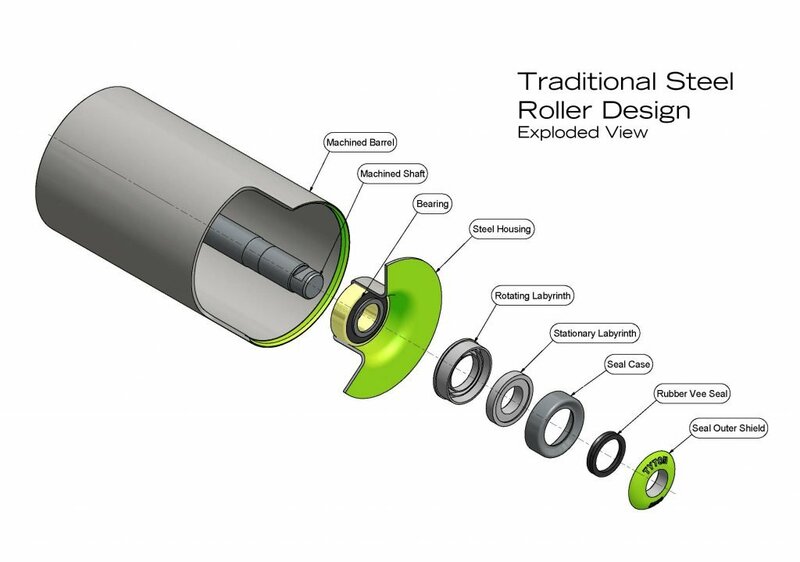 The process ensures that the shell is concentric to the housings to minimise the TIR of the completed Tyton roller. Breather holes are provided unless noted otherwise, to prevent the roller breathing through the bearing & seals when expansion & contraction occurs..
All shafts are manufactured from low carbon-free cutting steel. For special applications, hollow shafts can be used to reduce roller mass down to an acceptable level. The date of manufacture is stamped on one end of the shaft. Bearings are secured in end discs with an interference fit. The bearings are fitted to the shaft to international standards and physically locked to the shaft at one end, sandwiched, between a circlip and the shaft shoulder, while the other bearing is allowed to float on the shaft. Tyton rollers are fitted with ZZ shielded single row deep groove ball bearings, with a C3 or C4 internal clearance. These bearings have been selected because they give up to 0°10′ angular deflection in their operation, coupled with even load distribution within each bearing race. The inner seal is integral with the bearing (Z Shield), used for maximum bearing protection and minimum rotational resistance, The utilisation of this sealing arrangement cuts down on shell wear due to differential speeds between roller and belt. This is particular to return rollers which have light loads and essential for overland conveyors where power is a premium. The outer seal comprises a labyrinth seal which fills in the “well area” and incorporates an outer water/dust line contact seal. This labyrinth seal in conjunction with the ZZ shielded bearing gives superior sealing for the roller. The seals are acceptable for use in underground mines in Australia. All bearings are ZZ shielded and factory filled with lithium base grease, specially formulated to minimise roller drag and give maximum resistance to water wash out. The operating range for or standard rollers is from -20° to +130°C. 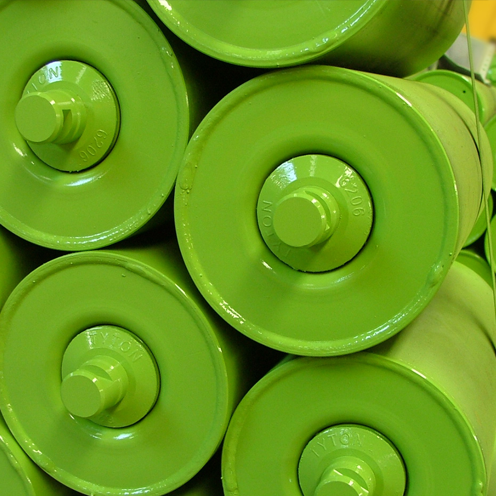 End discs are chemically degreased prior to welding to the tube, and solvent cleaned prior to being given one coat of VLI Green enamel paint. For special applications our roller shells can be hot-dip galvanised and ends protected with a special corrosion protective system on request. Tyton idlers have their own dimensional standards with regard to shell face-width and back to back slot dimensions, etc. as set out in the VLI Technical Manual. However, VLI can tailor manufacture idlers to suit the client’s needs, as in most cases companies have many varying idler brands in service. VLI can provide a service to the client by inspecting the site and ensuring the correct replacement idler is manufactured. For further information on Idlers, please download the VLI Idler catalogue. Our aluminium rollers have shells made from a high grade light weight special aluminium alloy and the bearing housings are made from specially formulated polyurethane, which are designed to be interference fit into the shell. Our aluminium roller is low noise, up to 10 dBA less than conventional steel Idlers. 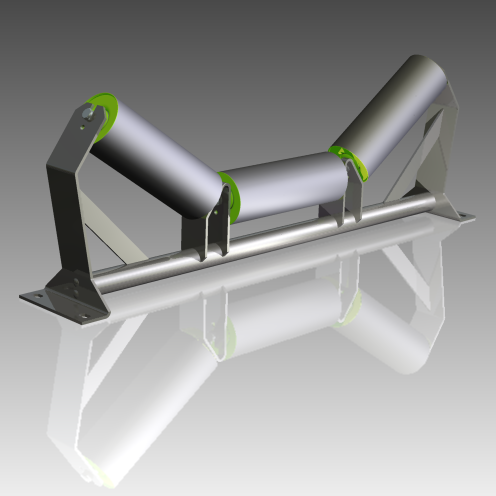 As our aluminium roller is made from low weight aluminium the Tyton roller is OH&S friendly. Due to the quality of our tube and housings the TIR (Total Indicator Run-out) & MIS (Mean Indicator Slope) of our aluminium roller is inherently low. 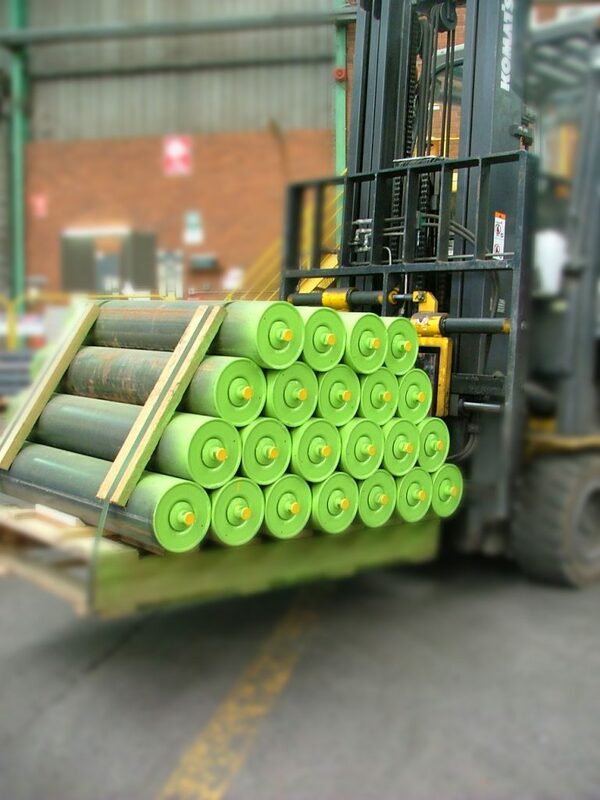 The standard balance of our aluminium rollers complies with ISO1940 G16. 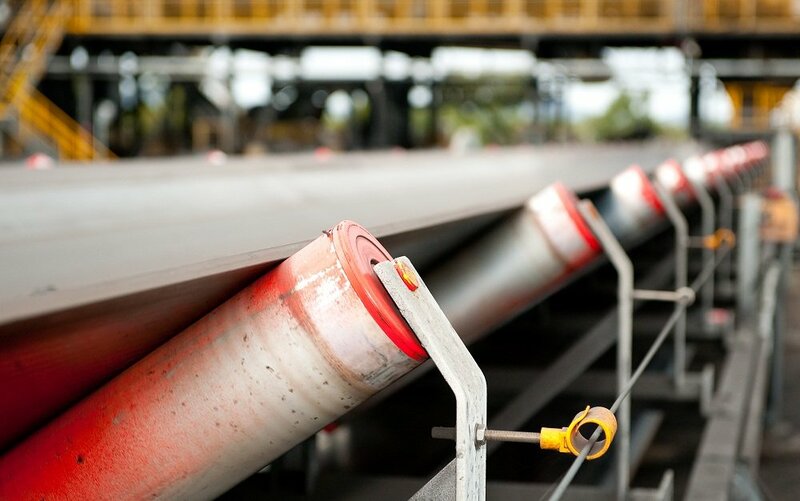 We can supply hot or cold vulcanised rubber to standard steel rollers from 6mm to 12mm in FRAS or natural rubber grades for specific applications. Additionally hot cast high performance polyurethane from 6mm to 12mm (or more) with hardness ranging from 55A to 70D. Our discs are manufactured from either natural or FRAS rubber (50 – 60 Shore A hardness) and pressed onto tube assemblies. Polyurethane discs, 55A to 70D durometer hardness, are also available. Roller face and ends can be lagged with polyurethane or rubber covering. We can also galvanise or coat the rollers with special zinc silicate paint. Tyton frames and brackets are all hot dipped galvanised, to AS/NZS-4680, which gives greater corrosion resistance and durability in a wide range of surface and underground environments. For special applications we can have them coated to client specifications.